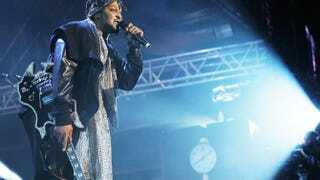 D’Angelo performs live for fans at the Sydney SoulFest Music Festival on Oct. 18, 2014, in Sydney. If two of the last things you remember from D’Angelo is his pulsating torso in the ever-popular video “Untitled” and then the singer’s fading off into obscurity, then you’ll be happy to know that he’s back in the limelight. D’Angelo’s Black Messiah was released Sunday right before the stroke of midnight, and the 12-song album is available on iTunes. After 14 years, people expect perfection, but what does perfection actually consist of when it comes to D’Angelo? With his personal life over the last 14 years marred with alleged drug use and management issues, the singer definitely has a lot of ground to cover. To some, Voodoo was and still is considered the Holy Grail when it comes to neo-soul music. It’s a bible of music filled with soul and decadent lyrics. It’s the prototype of all things considered neo-soul. And so is Black Messiah. “Sugah Daddy” was the first song released off Black Messiah this weekend, and another single, “Really Love,” will get radio play this week as well. D’Angelo’s voice still has the perfect falsetto range that the world came to love 14 years ago, and his band, the Vanguard, is nothing short of amazing. If you’re looking for music with meaning and feeling, Black Messiah is definitely something worth a listen, or two, or three.